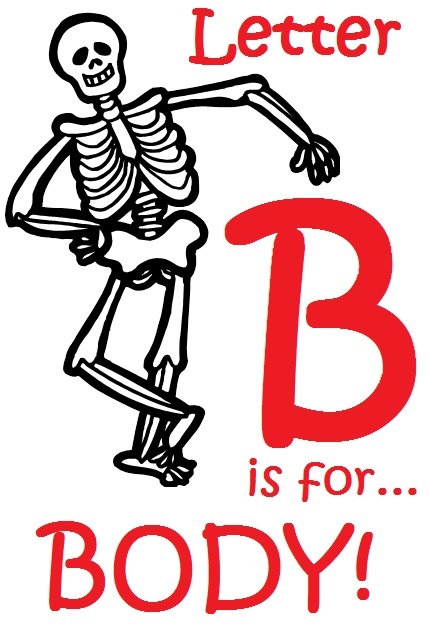 “Letter B is for Body Week” is next! The students dove right in this past week as they began their letters of the alphabet study. Can you guess which letter the students learned about first? If you said, “the letter A”, then you are correct! To help explore the Letter A, the students also studied all about apples! Read on below to learn about all of the fun that was had and learning that took place! Throughout the entire “Letter A is for Apples Week” the students arrived at school and immediately began filling up the “Share Box” with an Abundance of letter A shares! Take a look at the photograph below; it is full of letter A shares that were sent in! Can you say all of the Letter A words that you see? 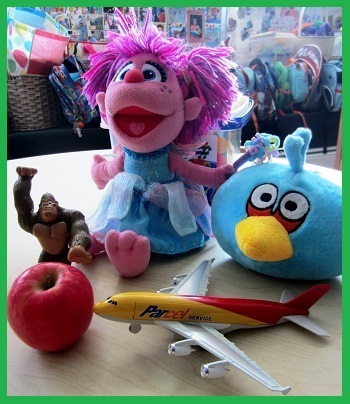 The A shares are Airplane, Apple, Angry Bird, Ape, and Abby Cadabby! Monday and Tuesday morning marked the introduction of alphabet “morning work” – letter and sound recognition activity coloring pages. Working one on one with the teachers, each student took a break from their morning play stations to come over, sit down and get to work! Whether it involved tracing, writing, or sounding out letters, the activity pages were completed beautifully! The 2013-2014 students of PPA are surely shining stars already. In the afternoon on both Monday and Tuesday, the students worked together as a group to create the first letter list of the school year! The list below features all of the words the students came up with! Talk about A lot of A’s! The students also hunted around the classroom for as many A’s as they could find. Whether the A’s were on books or just items that began with the letter A, one thing was for sure – there are A lot of A’s at PPA! Once the A’s had been found all around the school, the students discussed the various places where the A’s were – in the kitchen, on the books, on the walls, even on their clothing! Can you believe how many A’s were in the classroom? The students were sent home and told to find some more A’s in their homes. Do you see any A’s around you right now? Wednesday began the students’ art exploration of the letter A as well as the theme of the week – Apples! The day began with a whole class reading of Theo LeSieg’s (aka Dr. Suess) Ten Apples Up On Top. In the story, several animals compete to determine who can balance the most apples on top of his head. After enjoying the story, the students decided to give balancing apples atop their heads a try! Using a large foam die, the students took turns tossing the die into the air to determine exactly how many apples their headband would hold! What a fun and apple-riffic activity it was! On Wednesday afternoon, the students participated in their first Spanish lesson of the school year! For the next few weeks, the students will be learning about Greetings and Numbers. You may hear your child(ren) using some of the following vocabulary at home! The Park Prep Academy foreign language program takes place two afternoons each week. Please encourage your child(ren) to utilize this vocabulary as often as possible as a way to reinforce what is being taught in the classroom and also increase motivation for Spanish class. As the weeks progress, the students will be divided into two separate groups – Introduction to Spanish group (comprised of new/younger students) as well as a Beginner Spanish group (comprised of returning/older students). The learning goals for each group are similar- introduce and utilize Spanish vocabulary- but will be approached in different, more individualized and developmentally appropriate ways. The Introduction to Spanish group will be led by Miss Justine, Miss Thao and Miss Lauren and will be a very interactive approach to help expose and introduce the students to the Spanish language. The Beginning Spanish group will be led by Miss Jasmine and Miss Jocelyn and will utilize a more “immersion” approach to teaching/learning the Spanish language. Students in this group will hear both the Spanish and English translation of stories, conversations, and more! Keep checking your child’s daily note and the blog weekly to stay informed as to the vocabulary the students are studying. On Thursday morning, the students created another apple craft! This time it was a little different. Take a look at these Adorable Apples with a hungry and wiggly Amigo (friend) poking through! During the afternoon, the students had Spanish class again. The returning students were extra helpful in teaching the newer students the PPA hit song, “The Hola Song” which is sung at the start of each Spanish class. Listen in below! After spending a full week discussing and learning all about Apples, Miss Jocelyn and Miss Thao were really having a craving for some delicious applesauce! But where did applesauce come from? How do you make it? Thankfully for Miss Jocelyn and Miss Thao, the students of PPA are so smart; they knew applesauce came from apples that were mashed up! A skeptical Miss Jocelyn headed to the grocery store to purchase some apples and see exactly what the PPA students were talking about. After a quick bath in some warm water, the apples had softened a bit and were ready to be smashed and mashed by the students! In small groups, the students were given tiny mashers to mash up those apples into a goopy, chunky applesauce! Once the students had mashed away, the students added some cinnamon into their applesauce and it was enjoyed by all at snack time – much to Miss Jocelyn’s surprise! Friday afternoon wrapped up with a technology presentation All About Apples! The presentation began with an investigation into the question – Where Do Apples Come From? How do apple trees grow? and more! The students particularly loved the following Apple Tree video as well as this Letter A song! Well, that is all for Letter A Week. It sure was Amazing! As always, thank you for reading and have a fun and safe weekend! All PPA students and parents are welcome to attend this event. ALL STUDENTS (regardless of enrollment schedule) should arrive by 8:45 a.m. Individual portraits and class photographs will be taken. Students who do not attend school on Fridays (2 dayers) will be picked up before lunch at 11:45 a.m. Students who attend school on Friday will stay for the full school day.